Christopher Curtis and Aaron Halva accompany as Liz Wisan approaches. Emily Young dances as Smeraldina as her mistress, Clarice, played by Adina Verson, celebrates. Master played with juicy style by Orlando Pabotoy with the servant, Steven Epp. Cast: Liam Craig, AIdan Eastwod, Steven Epp, Allen Gilmore, Andy Groteluschen, Eugene Ma, Orlando Pabotoy, Sam Urdang, Adina Verson, Liz Wisan, Emily Young. 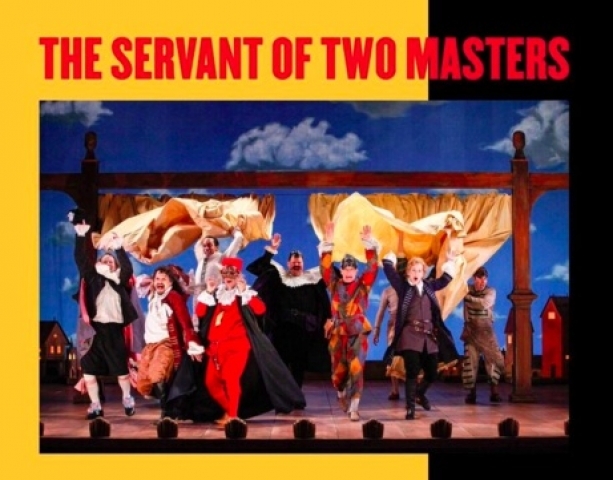 Carlo Goldoni’s The Servant of Two Masters is a play for the ages. The current production at Theater for a New Audience meets and exceeds every expectation. Steven Epp in the lead role of Turfalldino, a starving servant who wants food, but especially love, is a brilliant actor, a mime, a juggler and a trampoline artist. He speaks several languages including jabberwocky. He is half-masked, as are several other characters in Commedia del'Arte tradition. Turfalldino has just arrived in Venice with his master, who, it turns out is a "mistress." He takes on a second job to fill his stomach's needs. 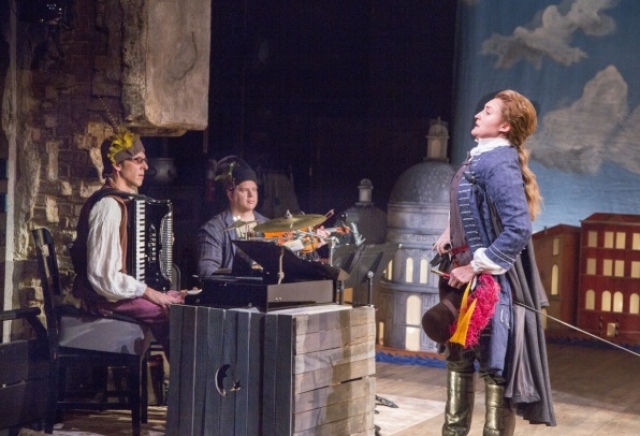 Like each and every actor on the stage, Epp finds the heart of the comedy in his character and succeeds in being mischievous, touching and amusing at once. All the actors perform under, over and behind the text. Eugene Ma is another standout. A man for all seasons as director, teacher and actor, he is costumed perfectly. His black shorts often rise to reveal white underpants. His stockings are held up by pink garters and bows. Tortured by unfulfilled love, his tipsy trips lead him to a reunion with Clarice. Clarice is played with high style by Adina Verson. We get consummate gestures, in wide-eyed facial expressions on just the right beat, and wild arm movements aptly frozen. The visual variety of the production is a delight, from a theater filled with blackness when the wrong switch is pulled, to a small band perched stage right and a curtained arch center stage, from which performers enter and exit. We can see the actors waiting in the wings of the larger stage. Throughout, the play within the play is a subject. 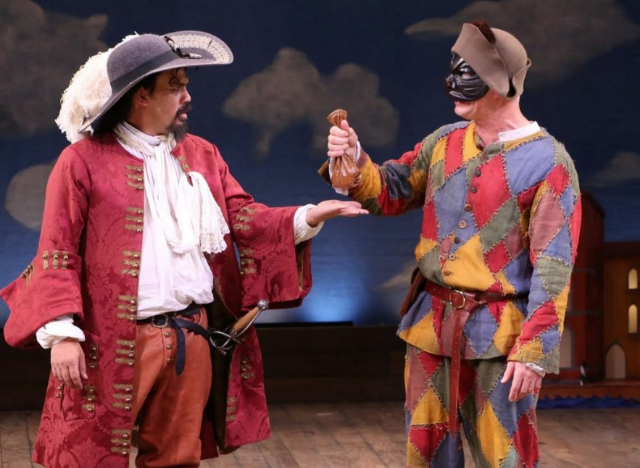 Improvisation, which drove the original Commedia del’Arte productions, is promoted. 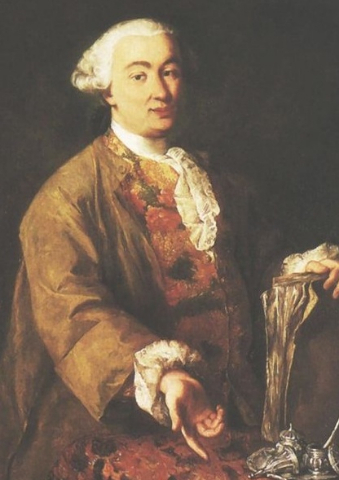 Although Goldoni had made his mark by writing everything down, Theater for a New Audience opens up an actor's response 'in the moment' again. 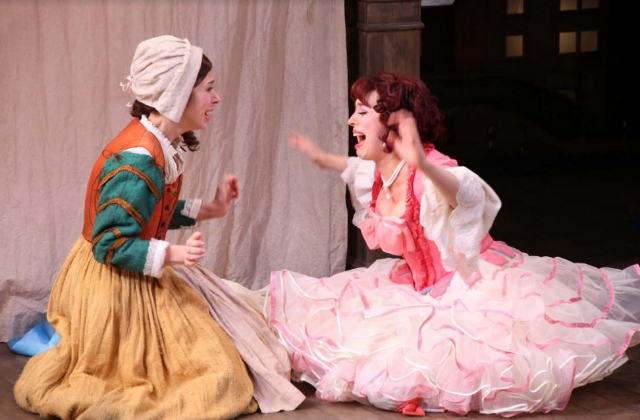 They give us a raucous and goofy Goldoni. Often the lines concern the not so hilarious outcome of the recent Presidential election, but with timeless slapstick comedy, they restore our sense that civility is possible. Flatbush is the answer to every question. Skilled actors are no longer servants to the text. This is a risky form of comedy but adapter and director Christopher Bayes shows us it is worth the gamble. The costumes are varied and bright. A miniature Venice fills the middle stage. Focus is all on antics, language and the play of one character with another. Inspired comedy is like a lightning strike and a wonder takes place at the Polonsky Shakespeare Center in this camp yet moving production.